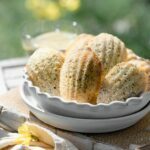 Recipe for Lemon Poppyseed Madeleines with Lemon Cream Cheese Icing. Light sponge cake texture with a wonderful lemon zest flavor. Perfect bite size cake servings and easy to freeze. Whisk together flour, salt, and baking powder in a small bowl. Set aside. In the bowl of a stand mixer with whisk attachment, combine sugar, eggs, egg white, zest, and lemon juice. Whisk on medium high speed for 8-10 minutes until a light airy foam like consistency is formed. Almost like a soft meringue. Remove bowl from mixer and slowly begin folding in flour mixture a quarter at a time, with the poppy seeds. Then, slowly pour in the cooled melted butter and gently fold into the mixture. Cover bowl with plastic wrap and set in the fridge for 45 minutes. Brush melted butter across each shell shape to prevent sticking. Fill each madeleine well with a heaping Tbsp of batter. Don't flatten the batter, it will melt and fill the shell shape as it bakes. Bake for 10-12 minutes until a light golden brown crust has formed around the edges. Let cool in pan for 5 minutes then remove and eat! Can add more powdered sugar or coconut milk for desired consistency.